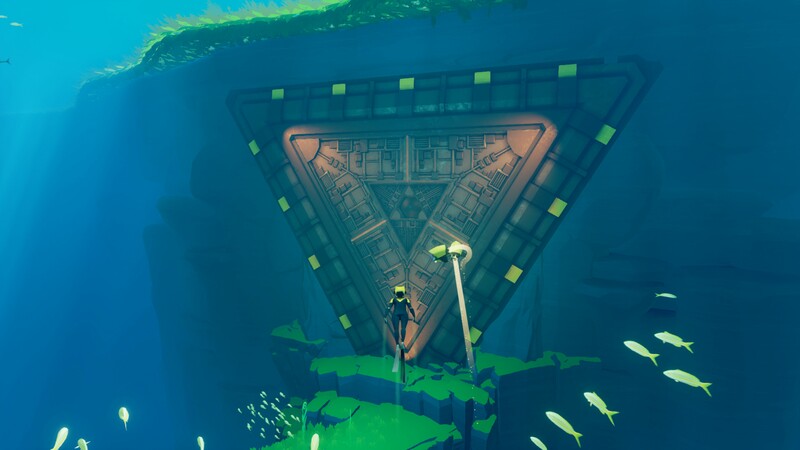 When I first saw the promotional screenshots and artwork for ABZU in a press release, I immediately felt drawn to play this game. Once I found out that ABZU is a spiritual successor to Journey, I felt like I really needed to dig into this game. But, hype doesn’t really matter, does it? After all, when the dust settles, what really matters is what we think of the game. 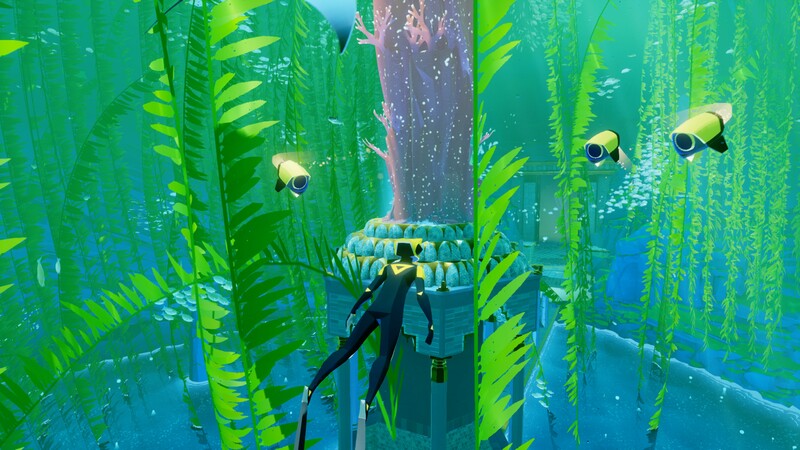 ABZU comes to us for the PC and PlayStation 4 from Giant Squid, a new company helmed by Matt Nava, the art director behind Journey and Flower. While not necessarily directly related to the popular 2012 PS3 title, ABZU seems to draw an awful lot of inspiration from that game. Much like its spiritual predecessor, ABZU‘s story is told wordlessly through gameplay and cutscenes. The main character (who many refer to simply as “the Diver”) awakens afloat in a relatively shallow area of the sea near a sprawling reef system after a rather mystical and existential opening sequence. Beyond a couple minutes where the game prompts you with hints about the basic controls, no direct indication is given as to where you need to go and what you must do when you get there. The crux of the game is about exploration, reflection, and interpretation, forming your own opinion based on the things that you discover and observe along the journey. Once you master the controls (a controller is highly recommended, though not required), swimming around the aquatic environments is fluid, fun, and quite relaxing. 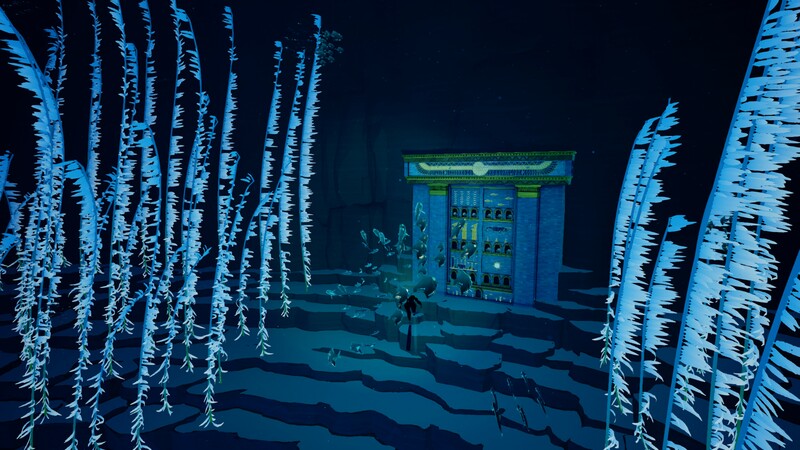 The environments are varied and well-crafted, taking the Diver on a journey through colorful reef systems, kelp forests, deep-sea caverns, jet streams, dark depths filled with bioluminescent creatures, ancient ruins, and much more. All manner of sea life can be encountered along the way, and while some creatures are scarier than others, at no time in the game do any of them pose a threat to your well-being. Near the beginning of the game, there’s a point where a large great white chomps down on one of your drones (and I admit, it was a bit of a natural jump scare! ), but outside of that, most all of the interactions with the sea life are positive (which was one of the goal’s of the game’s designers). Once you enter the reef, you’ll start to see some basic objectives you can complete. First, there are various “nests” (for lack of a better word) that you can interact with in order to release a new species back into the seas. You’ll also start to find various mechanical drones that are deactivated that you can turn on in order to get some mechanical help (opening blocked passages or lighting dark areas), some of which will be required to progress to the next area. You’ll also notice that there are some large sea shells hidden throughout the different parts of the game. Collecting these isn’t necessary for finishing the game, but gathering all of them will unlock something useful for you should you wish to play the game again once you reach the end (no, I won’t spoil that for you!). Most of the collection stuff isn’t required, but I personally found that it added to the fun, encouraged a deeper exploration of the environments, and added a bit of replay value to the game. There are some basic puzzles that you’ll encounter the further you go in the game, but most of these are relatively straightforward and may require finding a specific switch or lever somewhere in the area to activate and open a locked door or gate. It was rare for me to ever get stuck, as generally just a bit of exploration would solve most of the problems I encountered. The game itself is broken up into eight chapters (or “levels,” if you like), and although there’s certainly an ultimately-linear path that you’ll have to follow to finish the game, each of the levels is pretty big and opened up, and although the path forward is usually pretty clear, there are plenty of nooks and crannies to explore along the way. It’s worth pointing out that, much like Journey, this game does have a story, even if that story isn’t presented to us through direct dialogue or journal entries (as tends to be the case for many a walking simulator). Various murals with what appears to be ancient hieroglyphics are found in the ruins of a lost civilization that you explore in parts throughout the game, and if you pay attention to these murals, you’ll gain a sense for who these ancient people were, who the Diver is (yes, the Diver is directly referenced in a couple of the murals), and what these mechanical structures you encounter might be. The clues are all there, but they aren’t immediately pieced together for you. In fact, even by the end of the game you may still be left scratching your head, wondering what all just happened. However, this is one of the great things about ABZU: it’s about what you take away from your experience. Several folks have put together complex theories on who the Diver is, what the mechanical structures and beings are, and what happened to the ancient civilization that once existed in these salty depths. Chances are, if you play through the game, you’ll have your own theories too. The graphics in the game are surprisingly nice and detailed, and it’s really impressive to me how vibrant everything looks when there are hundreds of fish and other creatures swimming about. It makes you feel like you’re actually on an aquatic sight-seeing dive. The graphics menu is pretty straightforward, and the game has an interesting feature to not only allow you to play the game below the native rendering resolution, but also above it. Essentially, the game will let you scale the resolution down to 25% or all the way up to 200%. So, if you have a 4K display and wanted to see what the textures would look like with an 8K rendering factor, well…go for it, I guess? The soundtrack is another big plus for this game. Sadly, I did not see the OST for sale on Steam, but I definitely feel like the music is incredibly well-composed and is good enough that I found myself humming and thinking about some of the tunes later on. I guess the best comparison I can make to what the musical style is like is to say that it reminds me (in a very good way!) of the Myst series. Now, I’d be remiss to write such a detailed review of this game and not mention a couple small flaws that I encountered along the way. First, while I think the controls were implemented quite well all things considered, I found that in a couple instances they were a bit clunky and I’d end up getting turned around and mildly frustrated. Thankfully, as I said before, there aren’t any instances where you’re in any real immediate danger, so the tension isn’t high and it’s not as big a deal as it could be. I did, though, encounter a problem where the game would experience pretty severe, regular framerate dips and stuttering. I managed to power through this in order to finish the game (which is a sign of how good the game is! ), but after I finished it and was messing around with something, I actually figured out what the culprit was. Basically, the game’s Vsync implementation is buggy. The framerate was dipping and causing performance spikes. I fixed it purely by accident by tabbing out of the game to look at something else and coming back, noticing then that the game was running super smooth. So, if you tab out of the game and then bring it back up, you won’t experience these Vsync spikes anymore – at least not until the next time you play the game. The fix, then, was pretty simple (I suppose you could also disable Vsync and then force it or framerate control through your graphics drivers), yet I personally felt like it was something that should have been discovered and ironed out before release (or shortly thereafter). 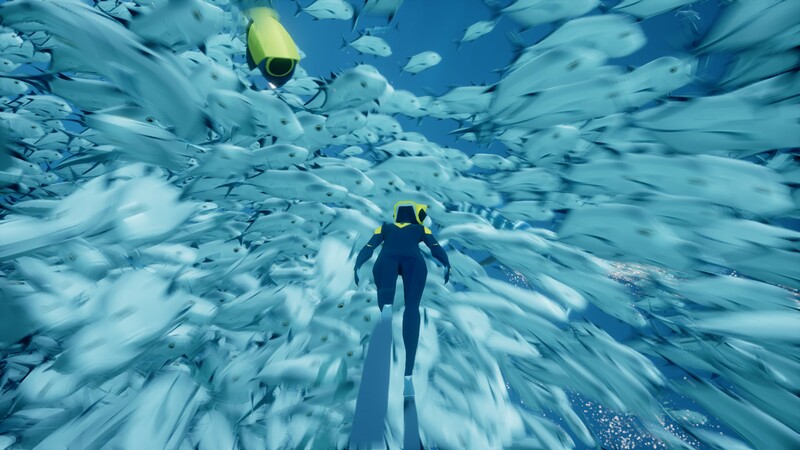 If you take your time, ABZU should take you about two to three hours to complete on your first attempt. Because I did a lot of exploration and found the vast majority of the secrets on my first playthrough, it took me between three and four hours to finish it. A speedy player who just wants to get through the main story can likely finish in under two hours. What this means, then, is that it’s a game that you should play at your own pace. Given the $19.99 asking price on Steam, though, whether or not the money is justified to you will depend on your personal style. For me, I felt like the price wasn’t asking too much because I sank over four hours with the game either in getting through the story or in just swimming around later on, enjoying some of the more memorable environments again. I also felt like the shell collecting added a bit more depth to the game. The story, too, is really good. If you think about it more like buying a ticket to see a three hour film (and buy some popcorn while you’re at it), the price seems much more easily justified. Overall, I had a great time with ABZU, and feel like it’s a worthy successor to Journey.